Where has Ina Forsman been all my life? Alright, considering that she's only about a third of my age, I'll at least ask why I haven't heard of her since the release of her recording in 2013. Quite frankly, this native of Helsinki, Finland is the hottest singer I've heard in quite some time. Her second CD as a headliner, the self-titled Ina Forsman (Ruf Records), has been played repeatedly by me ever since I inadvertently stumbled on a link to the album on the Amazon website. It's not a brand new album, having been released in January 2016, but I have a feeling that relatively few of our Blues Bytes readers have heard of Ms. Forsman. Let's fix that right now. What's truly amazing is that Ms Forsman, barely into her 20s, has such a mature tone to her voice, not to mention the fact that she wrote 10 of the 11 songs on this disc. The music here can best be described as a mix of blues, soul, swing, R&B and jazz. As if Ms. Forsman's powerful voice and creative songwriting isn't enough to make this a CD worthy of being played repeatedly, it was recorded in Austin, Texas using some of the best blues session musicians on the planet --- Derek O'Brien and Laura Chavez (guitars), Russell Jackson (bass), Nick Connolly (keyboards), Tommy Taylor (drums), and the Kaz Kazanoff-led Texas Horns. Also present was Finnish harp player Helge Tallqvist, who helped start this young woman's career in their native country (be sure to also check out the 2013 album they did together). The album opens with Connolly's piano intro on which he sounds just like Professor Longhair, leading into the New Orleans-ish "Hanging Loose." Ms. Forsman gives her sassy vocals a bit of a staccato enunciation to keep in sync with the piano notes. As expected, the Texas Horns provide a jazzy foundation in the background. We also hear the first similarities in her vocal phrasing to that of the late Amy Winehouse. (If you liked Amy's Back To Black album, then you will dig this one just as much, but Ina's disc is brassier and not quite as dark). The soulful "Pretty Messed Up" opens with a Memphis-style horn intro somewhat reminiscent of a solo heard on the Curtis Mayfield classic "People Get Ready," but then this tune turns into a cry for forgiveness and redemption. The flute solo midway through the song makes it all the more interesting. The slower jazzy number "Bubbly Kisses" is the first number where Ms. Forsman sounds more like Winehouse, although I believe Ina's got a little more power and range to her voice than Amy had. Muted trumpet accompaniment makes this one sound like it's from a much earlier era, which makes it even more incredible that it was written by someone just out of her teens. "Farewell" is another one in which Ina's vocal phrasing resembles that of Winehouse. It's a quirky tune with a bit of a reggae backbeat and ska horn accompaniment, and at times her vocals really just soar through the octaves. I often found myself saying, "Wow!" This song, more than any other, shows just how great a singer she is. Tallqvist comes in with a nice blues harmonica solo midway through the song. For my money "Farewell" might be the best song here. "Don't Hurt Me Now" is a slow blues featuring a nice guitar intro, followed by sultry, raspy vocals from Ina. Her voice takes on a more tortured quality here, while she emphasizes her pain by moving through several octaves during the course of the number. This song is jam-packed with blues feeling, making one wonder how Ms. Forsman acquired such pain and agony at a young age. More blues content follows on the shuffling "Talk To Me," with strong harp playing from Tallqvist. "You Want Me Back" is an anthemic soul number in which Ina stays resolute to the lover who jilted her and now wants back in her life. The whole band is tight as a drum behind her strong vocals, and Kaz comes in towards the end with a nice sax solo. "Devil May Dance Tonight" takes a more mysterious and ethereal tone, and the backing instrumentation, especially Connolly's piano, works well in reinforcing that mood behind the vocals. "Before You Go Home" is another one that could have come out of the Amy Winehouse songbook, with Ina begging her man to love her just a little bit more before he heads out the door. This one feels like old school R&B, and Ina's voice gets more desperate-sounding the further she gets into the song. "No Room For Love" gets back into a soul vein, but more up-tempo this time, as she's now got no room for that man of hers. Another extremely strong number with the horns really sounding great here. This gem of an album ends with the lone cover, a version of a slow Nina Simone blues, "I Want a Little Sugar in My Bowl." Ms. Forsman slurs the vocals from a lower register, appropriate for a good, bawdy tune like this one. I just can't say enough good things about this album. How it evaded my attention for nearly a full year will be an unsolved mystery, but I'm sure glad I clicked on that random link the other night. 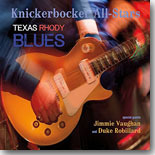 The Knickerbocker All-Stars are a loose collection of blues cats who spend time at the Knickerbocker, a renowned music venue in Westerly, Rhode Island. They jam there when not out on the road with bands like Roomful of Blues, Fabulous Thunderbirds, Sugar Ray & the Bluetones and the like, and about once a year they gather in a studio to create fantastic albums. Texas Rhody Blues (Jp Cadillac Records) kind of brings it all full circle, with veterans Duke Robillard and Jimmie Vaughan joining in on three of the album's cuts. Other sterling musicians found on this album include Roomful alumni Al Copley (piano), Doug James (sax), and Rich Lataille (sax), as well as guitarist Monster Mike Welch and guest vocalists Sugar Ray Rayford, Brian Templeton and Willie J. Laws. The rhythm section of Brad Hallen (bass) and Mark Teixeira (drums) also come from Roomful of Blues. It wouldn't be totally inaccurate to label this disc as "the missing Roomful of Blues album." It certainly captures that Texas blues vibe of their earliest recordings. Welch starts out the first cut, "Texas Cadillac," with a stinging guitar solo that serves notice to the more senior members of the group that he's every bit deserving of acclaim. Rayford pours out some extremely powerful vocals on this up-tempo blues shuffle, a great start to what's going to be a great album. Equally strong vocals follow on the next cut, the slow blues "You've Got Me Licked," which once again serves as a showcase for Welch's prodigious talents on guitar. Another really good slow blues is "Respirator Blues," with tasty piano work possibly from Bruce Bears and what is Welch's best guitar playing. Robillard and Vaughan get their first action on the mid-tempo blues shuffle "Going to the Country," with Duke handling the vocals. Good sax accompaniment here and tasty guitar licks from Jimmie. The Duke and Jimmie Show return for a Roy Milton blues number, "I Have News for You," that features really nice piano work from Bears, and the a slow, plodding number, "Blood Stains on the Wall." Welch and Rayford are both back to thrill us on "I Still Love You Baby," and Welch really shines on the T-Bone Walker classic "Tell Me What's the Reason." The latter follows a snippet of the real T-Bone talking about how he got his name --- a nice extra for this fine disc. There's a lot more here than what I've mentioned, and it's all good stuff. This disc makes it 3-for-3 on my own annual top ten list, so obviously I really like these guys. I can't wait for album #4, but in the meantime I'll be digging Texas Rhody Blues. Close to 20 years ago, a friend of mine turned me on to the musical charms of Trudy Lynn, and I am forever in his debt. A native of Houston�s Fifth Ward, Ms. Lynn started singing as a teenager, serving as vocalist for local greats I.J. Gosey and Clarence Green before striking out on her own. 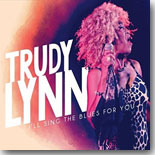 Since the late �80s, she�s released 12 albums for, among others, the late, lamented Ichiban Records, Ruf Records, Jus� Blues, and most recently Connor Ray Music, which just issued her latest, the splendid I�ll Sing The Blues For You. Lowell Fulson�s �Black Night� gets a smoky after-hours treatment and most will dig the interplay between Ms. Lynn�s vocals and Krase�s harmonica, along with Carter�s classy fretwork. Lynn also takes on the country (and blues) standard, �Honky Tonk Song,� a couple of tunes associated with Memphis Minnie (the slow blues �World of Trouble� and the playful �Kissin� In The Dark�), Big Maybelle�s �Ramblin� Blues,� a fierce version of Esther Phillips� �If It�s News To You.� One of my favorite Johnny Clyde Copeland songs, �Down On Bended Knee,� closes the disc. Lynn only brings one original to the table this time, �Thru Chasin� You,� but it�s a great one that fits perfectly with these standards and really captures her personality and style to a tee. The album title comes from her business cards, which read �Trudy Lynn: I�ll Sing the Blues for You.� Truer words were never printed. This album is a keeper, and so is Trudy Lynn. 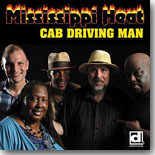 Mississippi Heat continues to be one of the most potent of the Chicago-based blues bands with a multi-talented line-up of singers, songwriters, and performers. Since harmonica player Pierre Lacocque assembled the group in 1991 and over 25 years later, despite multiple changes in personnel, they remain a driving force not only in the states, but also overseas. The band�s latest release, Cab Driving Man (Delmark Records), finds the group basically intact from their previous effort, 2014�s Warning Shot. Lacocque continues his superlative harmonica work, with Inetta Visor on vocals, Michael Dotson on guitar and occasional lead vocals, Brian Quinn on bass, and Terrence Williams on drums. There�s the usual bevy of guest artists as well, including Giles Corey (vocals, guitar), Ricky Nelson (bass), Kenny Smith (drums), Chris �Hambone� Cameron and Sumito Ariyo (keys), Dave Specter (guitar), Ruben Alvarez (percussion), and Sax Gordon (tenor and baritone sax). Cab Driving Man includes a whopping 16 tracks, 11 written by Lacocque, 3 by Dotson, with 2 covers. Visor ably handles the vocal chores on most of the disc, turning in fine performances on tracks like the spunky R&B opener, �Cupid Bound,� the title track, which is inspired by the legendary Cab Calloway, the somber slow blues �Flowers on My Tombstone,� the funky rocker �Icy Blue,� the jazz-flavored �Life is Too Short,� and �Rosalie,� which packs a tight Latin rhythm. Dotson�s three songs, �That Late Night Stuff,� �The Last Go Round,� and �Can�t Get Me No Traction,� feature the guitarist on vocals. His gruff and gritty vocal style is a nice complement to Visor�s smooth and sophisticated style, and his guitar work is particularly inspiring on all of the tracks. If you want to hear the blues at their best, you can�t get much better than Mississippi Heat. Cab Driving Man is just the latest jewel in this excellent band�s catalog. There�s not a dud in the bunch�..just an impressive set from start to finish. 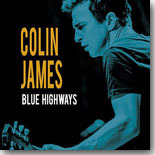 On Blue Highways (True North Records), Canadian singer/songwriter/guitarist Colin James decided to record some of his favorite blues songs by his favorite blues artists, each of which had inspired him in one way or another during his own storied career. Less than a week after completing his previous tour, James and his band began working on this album and completed it in two days --- 13 inspired covers of blues classics. James covers songs from Freddie King (a dazzling �Boogie Funk� that kicks off the album and a raucous take on �Going Down�), Tommy Johnson (a rocked-out �Big Road Blues�), Amos Milburn (a gently swinging acoustic �Bad Bad Whiskey�), Muddy Waters (a Delta-soaked �Gypsy Woman�), Jimmy Rogers (the slide-driven �Goin� Away�), and Junior Wells (an up-tempo version of �Hoodoo Man� that works really well). James gets a big hand from his band on these tunes. They include guitarist Craig Northey, keyboardists Simon Kendall and Jesse O�Brien, bassists Norm Fisher and Steve Pelletier, drummers Pat Steward and Geoff Hicks, and MonkeyJunk�s Steve Marriner on harmonica. Backing vocals are provided by Chris Caddell and No Sinner�s Colleen Rennison. Like any good collection of blues classics, Blue Highways is a loving and reverential set that will encourage listeners to check out more of Colin James� catalog as well as the original versions of these songs. The wit and wisdom of the Rev. 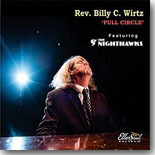 Billy C. Wirtz is on full display via his new EllerSoul release, Full Circle. Wirtz is part serious blues piano man, having been mentored by the great Sunnyland Slim, and part manic rock & roller in the Jerry Lee Lewis tradition. For this latest masterwork, the good Reverend is joined by several special guests, including guitarist Bobby Driver, harmonica player Li�l Ronnie Owens, and the legendary Nighthawks. The album is split between a live acoustic setting and a few studio tracks. There are also recreated fan favorites, such as �Mama Was A Deadhead,� �Mennonite Surf Party,� and �Daddy Was a Sensitive Man,� with a few new tracks (�Too Old,� �One Point Five,� �Daddy Passed Away,� �I�m A Senior,� and �Who Dat (Rev�s Theme),� ) that should become fan favorites. Wirtz also goes serious (somewhat) on cover tunes like Bill Black�s �Smokie� (here as Part 2 and Part 2.5), a rowdy reading of Charlie Rich�s �Breakup,� the classic �Drinkin� Wine Spo-Dee-o-Dee,� and a gorgeous take on Floyd Cramer�s �Your Last Goodbye.� Wirtz also covers John R. Butler�s �The Hand of the Almighty,� which is definitely not one you�d want to play for Grandma. Wirtz is a dazzling piano player, and his vocals are as entertaining as his songs. It�s been a long time (ten years) since his last release, so Full Circle is not only a welcome sight for longtime fans, it will also serve as a first-rate introduction to newcomers, whether they dig the blues or rock n� roll. 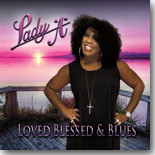 Lady "A has been a fixture on the Pacific Northwest blues scene for nearly 20 years. She�s toured with and opened for an impressive list of blues stars, including Denise LaSalle, Little Milton, Bobby Rush, Super Chikan, and Shemekia Copeland, and Dexter Allen. Her previous two albums have both been nominated for Blues Music Awards, and her third release, Loved, Blessed & Blues looks poised to follow suit in short order. Lady "A" ventured to Joey Robinson�s JRob Studios in Jackson, Mississippi for this excellent set of soul/blues. She composed four of the ten tracks, with her longtime collaborator/producer John Oliver III writing three, and new producer Dexter Allen contributing a pair. Allen mans the guitar, bass, and piano, while Robinson doubles up on keyboards and drums and Lady "A"�s sultry, smoky vocals do the rest. Lady "A" pays tribute to a list of many of these artists in the title track, a smooth shuffle which opens the disc. �Honey Hush� is a funk-driven recalling some life lessons learned at an early age, and �Don�t Let Your Blues Become A Crime� finds Lady "A" testifying with a punch backed by Allen�s lead guitar and a velvety cushion of keyboards. If you enjoyed southern soul blues over the past couple of decades from labels like, say Malaco Records or Ecko Records, for example, Lady "A" and Love, Blessed & Blues should do the trick nicely. 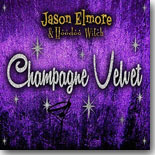 For their third release, Champagne Velvet (Underworld Records), Jason Elmore & Hoodoo Witch changed directions a little bit. The Texas trio�s previous output leaned more to the rock side of the blues, but while that rocking edge is still present, there�s more of a blues and soul focus on the 14 original songs featured here. All were written by Elmore (vocals, guitar), who is backed by his rock-solid rhythm section of Mike Talbot (drums) and Brandon Katona (bass). The festivities kick off with the sizzling �House Rockin� Boogie #7,� a rousing jump blues that will make you want to hear #�s 1 � 6. The amusing Lone Star shuffle �Double Your Money� sounds like a mix of Lightnin� Hopkins and the Fabulous Thunderbirds, and the sleek urban-styled �Midnight In Memphis� is a marvelous number. �Maybe� is a fine blues rocker with a bit of southern flair, and �Shine Your Light� is a nice countrified soul ballad. Champagne Velvet is a stone blast from start to finish. Jason Elmore & Hoodoo Witch have previously established their blues rock credentials, but with this release, they prove that they�re more than capable of turning out more traditional blues fare as well. This is a fine effort that will appeal to fans of both styles. 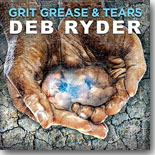 Deb Ryder�s third release, Grit Grease & Tears (BEJEB Music), just hit the racks and features her best batch of songs and performances yet. Surrounded by an all-star cast of musicians, including drummer/producer Tony Braunagel, guitarists Johnny Lee Schell and Kirk Fletcher, bassist Ric Ryder, and keyboardist extraordinaire Mike Finnigan, plus a special guest list that includes guitarist Albert Lee, singer Sugaray Rayford and harmonica ace Bob Corritore, Ryder blows through this 12 song set like a hurricane through a Kleenex. Kicking off with the funky shuffle �Ain�t Gonna Be Easy,� certainly grabs the listener�s attention with Ryder�s boisterous vocal. Her duet with Rayford on the spicy �Get A Little Steam Up� is a standout, too, as is �Blink Of An Eye,� a southern rocker with a crisp turn on harmonica from Pieter Van Der Pluijm. The title track is an edgy Delta-fueled adventure with Corritore�s harmonica providing subtle backing and guitar work from Fletcher and Schell, and the soulful �Sweet Mary Anne� features horns from Joe Sublett (tenor sax) and Darrell Leonard (trumpet). Deb Ryder just gets better with every new release. Grit Grease & Tears continues her hot streak as one of the best blues vocalists and songwriters currently practicing. Donald Ray Johnson has been playing music nearly all of his life, working as a drummer performing with a host of blues (Big Mama Thornton, Phillip Walker, Percy Mayfield, Lowell Fulson) and R&B stars (the Isley Brothers, Teddy Pendergrass, the Commodores), even striking platinum as part of the �70s disco group A Taste of Honey with the classic #1 hit, �Boogie Oogie Oogie.� Now based in Calgary, he�s focused on singing for several years, having released a �Best of� collection about two years ago. Recently, Johnson released Bluesin� Around, a sterling set of traditional blues covers with a few well-crafted original tunes, all mostly in the smooth urban blues vein. He�s backed by the Gas Blues Band (Gaspard Ossikian � lead/rhythm guitar, Pierre Cayla � lead/rhythm guitar, Philippe Scemama � bass, Yannick Urbani � drums) along with guest musicians Daniel Antoine (keyboards), Samuel Dumont (saxophone), and Nicolas Gardel (trumpet). Johnson covers tunes from B.B. King (�Bad Luck�), Willie Dixon (a funked up �Ain�t Superstitious�), Phillip Walker (�Ninety Proof,� �Big Rear Window�), Lucky Peterson (�You�re The One For Me�), and Nat Dove (a raucous �She�s Dressing Trashy�). He does a fine job transforming Joe Louis Walker�s �Bluesifyin�� into an autobiographical track of sorts, and he also covers �Distant,� a funky track from A Taste of Honey�s debut release written by former bandmate Janice-Marie Johnson. Johnson also contributes a pair of original tunes, �Watching You� and �Should�ve Been Gone,� a pair of old school tracks that mix blues with R&B nicely. 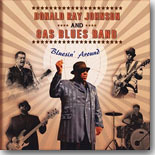 With The Gas Band, Johnson appears to have found a band that fits his vocal style to a tee. Ossikian and Cayla alternate on lead guitar and both are superlative, as is the rhythm section. Bluesin� Around is a fantastic set of blues that should satisfy any blues fans who like the traditional style of urban blues and R&B. Donald Ray Johnson is a blues singer who deserves to be heard by a larger audience. The Charlie Wheeler Band is a blues/rock trio based in Northern Pennsylvania. While the trio (Wheeler � vocals/guitar, Rad Akers � drums, and Dave Fink � bass) can really rock the house, they�re also highly regarded for their original compositions and that�s readily apparent in the group�s latest release, Blues Karma And The Kitchen Sink, a stellar set of original tunes that successfully fuse blues and rock. Wheeler is a strong vocalist and has guitar chops to burn. Akers and Fink are a steadying presence in a variety of styles, all rooted firmly in the blues. 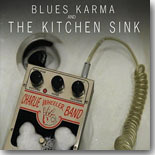 Blues Karma And The Kitchen Sink is a first-rate listen for anyone who digs blues that lean toward the rock side of the aisle. The McKee Brothers are Denis McKee (guitar/keyboards/bass/vocals) and Ralph McKee (bass/vocals/lap steel/guitar). The brothers have been a part of the Michigan music scene since the �70s, playing blues, reggae, funk, jazz, fusion, and rock. Brother Denis relocated to California, while Ralph remained in Ann Arbor, but the two have joined forces, along with some of the finest musicians from L.A. and Michigan, for a project, Enjoy It While You Can, that puts their talent and versatility on full display. This is a fun and entertaining album, with some inspired and enthusiastic performances. The 14 compositions are a combination of originals, with a couple penned by both of the McKee brothers, several written by keyboardist Bobby West, and three covers. The songs cover the gamut from urban blues to southern soul to New Orleans-flavored R&B. The McKees have a huge supporting cast on these tracks, including guitarist McCray and Kirk Fletcher, former Janiva Magness keyboardist Jim Alfredson, former Tower of Power horn players Lee Thornburg and Doug Webb, and former Rufus bassist Bobby Watson, just to name a few. Enjoy It While You Can should have something to satisfy any music lover. 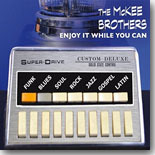 The McKee Brothers cover a wide range of musical styles --- blues, rock, soul, funk, gospel, and Latin --- with this enticing collection. 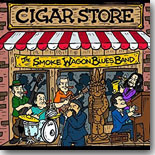 The Smoke Wagon Blues Band recently celebrated their 20th year of existence by releasing their seventh album, Cigar Store, which features 13 tracks (a dozen originals with one cover) of rocking blues and R&B that show why they�re considered one of the best Canadian blues bands. Fronted by singer/harp player Corey Lueck, the band includes Mike Stubbs (guitar/backing vocals), Nick Succi (keyboards), Gordon Aeichele (saxophone), Jason Colavecchia (bass), and Tibor Lukacs (drums). Lueck�s rugged vocals are a perfect fit on this varied set of tunes and he blows some serious harp on several of these tracks. The band settles into groove after groove snugly and are supplemented by producer Steve Sherman, who provides percussion, organ, bass, and backing vocals where needed. Cigar Store is another fine addition to the catalog of The Smoke Wagon Blues Band, one of Canada�s finest musical exports. Nashville guitarist Randy Stephens� latest effort, Treat Me Like A Stranger, offers a dozen original tunes, ten written by Stephens plus two covers. He�s backed by his band, The Groove Makers (Carl Greico � drums, Marty Bednar � bass, Bob Robinson � keys), with special guests John Reece (sax/harmonica), vocalist TJ Hitt, and guitarist Steve Arvey. Stephens also includes a pair of unique cover tunes that you probably won�t find on many blues albums. First up is a blues/rock interpretation of the Morris Albert mid �70s soft rock hit, which works surprisingly well thanks to a inspired vocal from Stephens. The other cover is a previously unreleased tune penned by Prince, �If I Had A Harem,� also well done. 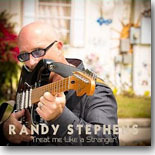 Treat Me Like A Stranger is Randy Stephens� strongest release yet, a strong set of original tunes and performances that focus on blues rock with pop overtones. This set should please any discriminating fan of blues rock.